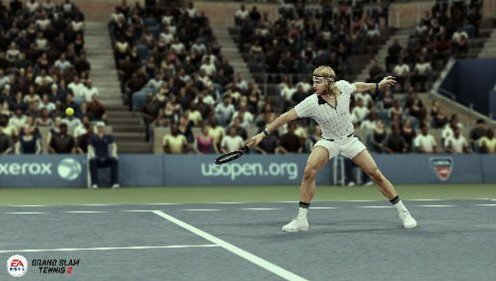 I’m Thomas Singleton, Producer on Grand Slam® Tennis 2 and I’m very excited to be announcing its upcoming release for the Xbox360® and PlayStation®3. You can now swing the racquet like a Grand Slam® Champion in full HD featuring the all-new Total Racquet Control (the first real gameplay innovation in the Tennis category – finally on the right stick), PRO AI (where player styles become strategy) and so much more. Here’s a quick look at some of the things we have in store for you in 2012. Grand Slam® Tennis 2features some of the greatest legends from the past and present. Exclusive to our roster is the great John McEnroe who not only can you play as with his infamous afro, headband and old school shorts, but also provides commentary along with Pat Cash so you can imagine how entertaining that will be!And for the tennis fans in France you will hear the action called by none other than Guy Forget! Our all-new Total Racquet Control system is the feature we on the development team are most proud of in Grand Slam® Tennis 2, and it’s definitely a game changer. For the first time in a tennis game you can control the entire experience without pressing a single button. Total Racquet Control with the right analogue stick is the first true innovation in the tennis genre in years. The right stick literally becomes your racquet, while the left stick drives your player’s legs and movement around the court. You will immediately feel the difference and control this innovative control system provides and you can switch back to button controls to compare for yourself. Where we really bring the product to life in Grand Slam® Tennis 2 is with the introduction of our PRO AI system, which has your favorite players playing like themselves while also allowing YOU to use these same tennis styles to your strategic advantage. Each of our players look, act and move like their real life counterparts. From their signature animations, to their emotions and authentic play styles, PRO AI gets you in the tennis game.